1 x wooden ring with crocheted element. Natural textures of unfinished wood and cotton yarn, soft neutral colors with splashes of pastels bring a touch of boho into a nursery. The wooden and crochet textures, attractive colors, wooden rings providing soft rattling sounds offer a fun distraction for babies while stimulating development of their visual and motor skills. Your baby will get so much joy from the sensations, sounds and visual delights the toys give. - The length of the toys is 11''-12'' (28-30 cm). SAFETY: Constant adult's supervision is required. This product contains small beads which may pose a choking hazard when the item or any part of it is broken or damaged. Check the item every time before giving it to your baby. Not a teether. 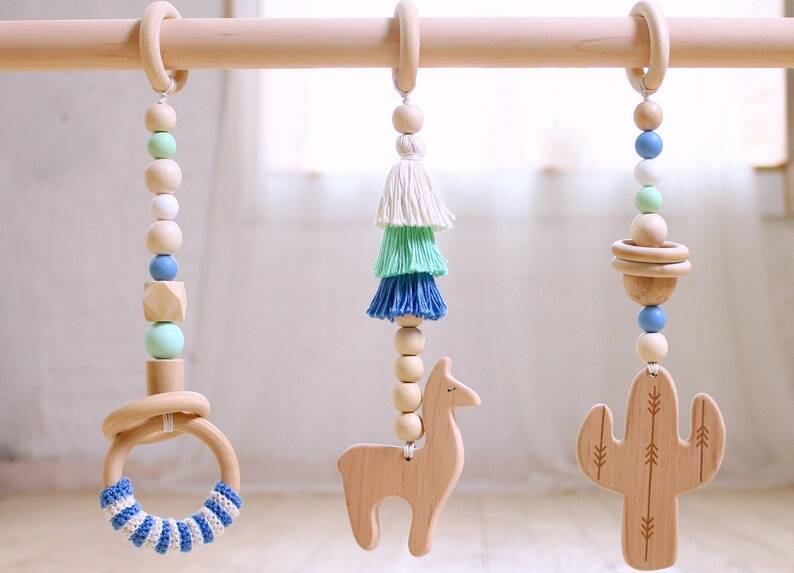 Boho cactus wooden baby gym toys set of 3. Desert. Saguaro. Mobiles ONLY. Activity center toys, play gym toys wood. Baby gym toys set of 3. Mobiles ONLY. Buffalo, arrow. Southwest. Desert. Navy and gray. Activity center toys, play gym toys wood. Good quality, well crafted. My baby loves it. Love them!!! Getting daddy to attach them onto gym ASAP! They can hardly wait! Nautical baby gym toys -READY TO SHIP - set of 5. Bear the sailor, dolphin, whale, octopus, starfish. Sea Ocean Marine. Crochet rattles.